I'm currently looking for people to take on roles for Moon and Hau for a video based on this comic by Rainy. As always, this video will be uploaded on GabaLeth, the YouTube channel of mine and my bro's. We've already uploaded plenty of videos on this channel, so feel free to check out what you're trying out for. For anyone who's casted, you can count on me to tweet the finished video to you whenever it's uploaded on the channel. It'll sometimes take awhile before we release certain videos, but it'll happen. To everyone who auditions, thankya for your time! She's the protagonist. A variety of teenage girl interpretations could fit her, as long as it's leaning toward the cheerful and enthusiastic side! (cheerful) They were having a huge Malasada sale, so I went ahead and bought a ton. Here, there's plenty just for you! 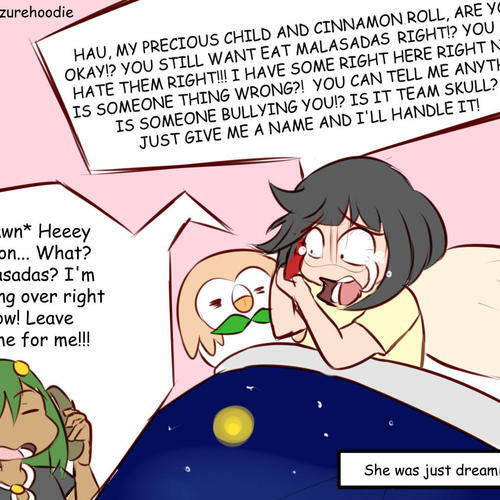 (freaking out, talking really fast) HAU, MY PRECIOUS CHILD AND CINNAMON ROLL, ARE YOU OKAY!? YOU STILL WANNA EAT MALASADAS, RIGHT!? I HAVE SOME RIGHT HERE RIGHT NOW! IS SOMETHING WRONG!? YOU CAN TELL ME ANYTHING! (dead inside) I reject that reality. 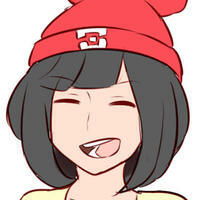 He's the super friendly and upbeat rival of Moon. A variety of teenage and young adult voices could work for him, as long as it's upbeat! His name sounds exactly like the word, 'how', so expect a ton of puns. (cheerful) Hey! Hau ya doin'!? 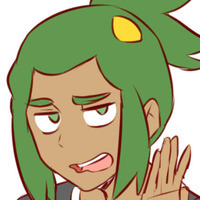 (disgusted) Ugh, hau disgusting. No thanks, I'm not in the mood for malasadas. I don't feel like eating them right now. I feel kind of sick just looking at it. (super disgusted) Ew, no. I hate those. In fact, they're my least favorite food in the world. I'd rather die than eat one of those. (instantly super wide awake) Malasadas!? I'm coming right over now, leave some for me! !